I love the job I do. It’s about as perfect as a job can get. It’s actually the first work as an employee that I’ve had since I ended my twelve year career in pub management in 1990. After that, and until I started working here at Calcutt Boats, I ran my own businesses, mostly fairly successfully until a poorly though out national expansion plan resulted in huge debts and those lovely people at Revenue and Customs leading me non too gently into bankruptcy. I love the complete absence of pressure I enjoy these day. I have no staff to worry about, no late night financial juggling robbing Peter to pay Paul, no worry about where the next order is coming from and whether it will be enough to satisfy my ever increasing number of creditors, no agonising over whether I can actually afford to pay myself a wage at the end of each month and no worrying about taking a holiday away from the business because of the stress the break causes. And gone are the days when I have to dull my senses through copious and unhealthy quantities of alcohol. I am completely pressure free, stress free and free from the wish to keep up with the Joneses and spend money that I don’t have. 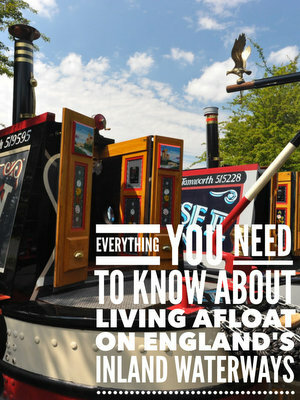 Living afloat is responsible for my stress free life and so is the job I do here at the marina. I love nearly every aspect of the work I do here and the wide variety of tasks I have to complete. I say nearly every aspect because sometimes I have days or parts of days when I can’t honestly say that I’m enjoying myself. Clearing sewage blockages is one of my least favourite tasks. At least once a month, usually in the summer and usually on a hot day when the smell of human waste is strongest, either Patrick or I get a radio call to alert us to a sewage problem. It usually involves one of the Elsan points and a cap off a cassette toilet. The pipes which carry all of the site sewage, from the office toilets and the public toilets next to them, from the Elsan point and the pump out machine on the wharf, from the shower block toilets and from the Elsan point and the pump out machine in front of the shower block, have just a slightly larger diameter than the plastic caps which some boaters seem to delight in pouring into the Elsan point along with their bodily waste. Clearing the blockage can take as little as a couple of minutes. The record however is seven hours one very warm day last summer at a particularly difficult area to clear in our tip area which involved a 50m length of rods, a great deal of cursing, and a very smelly pair of overalls by the time I had finished. Another regular, less smelly, but almost equally unpleasant task at this time of the year is cutting the grass around the car park between our temporary moorings and our older Locks marina. The thirty feet high bank facing the marina is at an angle of about forty five degrees. Cutting the grass in this area involves pulling our antiquated mower up and down the slope with a rope for about six hours to get it all done. It’s not very pleasant. Another infrequent but always painful task is any kind of digging. The site sits on Lias clay over a wide plane of Blue Lias which is quarried locally as a raw material for making cement. The pub on the GU at Stockton is named after it. I suppose any clay is unpleasant to dig but Lias clay is the only clay I know. It has the consistency of toffee and welds itself instantly to boots, spades ad forks and, on Monday, our hired rotavator. We had three areas which needed turning over and levelling prior to sowing with grass seed. Although we haven’t had a huge amount of rain in the last few weeks, the clay was still very, very tacky. The 8hp machine just wasn’t up to it. The rotavator didn’t have the power to either turn the clay over or to move forward. Pat and I ended up almost having to drag it across the ground, stopping every two or three minutes when it stalled to try and remove the clay glued to the blades. We spent six hours doing this, mainly under cloudy skies but sometimes in heavy showers and the occasional hail just to make the day more interesting. It’s all done now, but not done well enough. I feel as though we’ve wasted a whole day. We really need to wait until September when we can be reasonably sure that the ground is dry and that the rotavator has a fighting chance of doing job properly. Back on the boat, I’ve had some more work done. My office is now neat and tidy thanks to an additional three 230v double sockets which means that I can now dispense with the unsightly multi socket extension lead coiled under my desk which didn’t help Sally’s blood pressure every time she tried to clean around it. It’s another step towards both a completely updated boat and domestic bliss. Of course parts for this engine are difficult to find and are consequently quite expensive so the cost of £114 for next day delivery wasn’t a surprise. The engine is now fully operational but the alternator sadly is not. It’s not putting any charge into the batteries at all so that too is going to be replaced. I’m hoping that the engine will treat me gently after I’ve emptied my wallet into it. Time will tell. There’s one final expense in the engine room before I put my hard earned cash away. The starter battery has died, possibly as a result of not being charged effectively, or at all, by the alternator for quite a while. I’ve been aware for a few months that the battery wasn’t holding a charge but following the installation of my Smartgauge battery monitor I’ve been able to watch a daily visual display of its demise. On Friday I said goodbye to my old seat covers. Karl Lassinder from K C Covers came to take them away and to leave me with some temporary seats to use for the ten days before he returns with the eight freshly upholstered seats and backs. In addition to recovering the foam, he’s going to adjust them slightly. The seats’ thickness will be increased by two inches to make them slightly more comfortable and, of course, the sea backs will need to have their width reduced by two inches so that both seats and backs still fit into the same space as the old ones. The material we’ve chosen should be far more durable than what we have now. To be quite honest, it’s poor quality and an awful shade of light green. Boat seats get a fair amount of use and on James, have had a fair amount of use from me collapsing in an untidy heap after a hard day’s work. Unfortunately when I first moved onto the boat I didn’t have the steadying influence of a good woman, or a bad one for that matter, so I was in the habit of sitting down before I changed out of my work trousers. Consequently the places I regularly sat were quite badly marked. Sally tried to clean the upholstery but because of the quality, cleaning it just resulted in the material stretching and sagging. We bought the new material from Just Fabrics in Burford. It’s just over forty miles from the marina but it’s a pleasant hour’s drive through the Cotswolds to Burford and both Sally and I had used the shop in our previous married lives. The material we’ve chosen is Arielli Paprika, a rather fetching colour which will go well with the curtains. Karl has left me with some temporary seats which he’s just removed from another boat. Coincidentally, the seats he’s left me are in a similar colour to the material we’ve chosen. The colour looks wonderful, the seats do not. They’ve obviously come from a much larger space than we have available for the seating on James so, although they’re very comfortable to sit on and are certainly better than nothing, they almost completely block the isle past the lounge area into the rest of the boat so I have to remove the seat if I want to walk through the boat. Fortunately for me, the work should be completed before Sally comes back from the Philippines so there won’t be two of us trying to get past the too large seats in an already very tight space. “There’s a huge amount of information on the site now. Much of it has been added by me over countless late nights and early mornings but much more has been contributed by a wide variety of experienced boaters. There are now four hundred and eighty pages of information on the main part of the site and a further four thousand nine hundred posts on the forum. Last week the index was just the more popular forum posts in alphabetical order. In the last seven days I’ve added all of the articles from the site and links to the main subject in just under half of the newsletters from the archive. I keep a close eye on the forum. I am very pleased with the way it has grown over the last eighteen months and I am eternally grateful to those of you who have taken the time to contribute to its success, both by posting comprehensive answers to forum visitors’ questions and by having the courage to ask those questions in the first place. I know that making a post which is going to be read by hundreds, sometimes thousands, of site visitors can be slightly unnerving. I thank you all for your contributions. I’m very pleased the way the forum has developed, but not all posts are welcome. I sometimes get unwelcome and useless spam posts which have nothing to do with boating and which are nothing but an unwanted distraction. Up until today, identifying the spam posts has been a hit and miss affair. If I see them by chance I delete them instantly, but many have slipped through the net. I installed some code today which identifies all new posts then presents me with a list of them each time I visit the forum. I will be able to catch all of the spam posts from now on but unfortunately the code doesn’t work retrospectively. It won’t identify any spam posts already somewhere on one of the forums which I have missed. Can you help me with that? Just send me a quick email and include the URL of the offending post. To send me the URL, just copy the address in your browser’s address bar and paste it into the email. Thank you.